Still, I think I’m in love with this book. Ella is a little ladybird with big dreams. But her ugly wasp stepsisters make her do housework all day long, and Ella feels very sad. Then one day the famous Parisian artist Pierre decides to throw a party. And on the day of the Grand Bug Ball, Ella’s life changes forever! 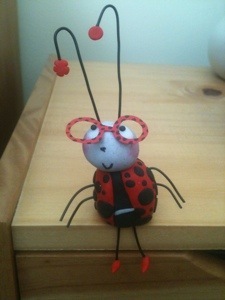 Ella is a ladybird who rocks her dots and her glasses, and can stand up for herself. Her meanie step-sisters tell Ella she’s not going to join in. “Oh yes I am”, she replies. This book is full of positive role models and affirming images for children (and grown ups). It’s the closest I’ve seen to a feminist version of Cinderella for little people. There is no fairy godmother to rescue Ella, no magic to make her dreams come true, just a great friend, a swig of self-belief and a pair of snazzy specs. And hooray for that. Ella needs nothing more to win Pierre’s heart and prove that she is the star of the ball. The language doesn’t patronise, it is full of wonderful words for little people to learn. Like ‘enchanting’ and ‘spectacular’. The story is full of humour and fun and the message is clear- be yourself, be open to adventure and follow your heart. Just like the story, the illustrations are quirky and full of sparkle and fun. There are funky pages of pinks and reds, flowers and hearts but, crucially, it never tips from funky to sickly. With shiny flowers on the cover, buttons for antennae, and bright, bold illustrations throughout, Ella is a very impressive book about a very groovy ladybird. Alex T. Smith definitely gets my Ronnie rhino hurrah! In honour of Ella, I have made a little version of her to remind me always to be myself.